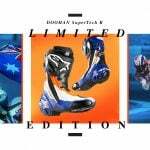 We should’ve seen this coming when they started making MotoGP mechanics wear helmets. Aprilia says it will introduce its DAQRI Smart Helmet at this weekend’s San Marino MotoGP at the Misano World Circuit in Italy. A heads-up display inside the shield lets them monitor all aspects of the bike in real time while it protects the noggin. Oh man. 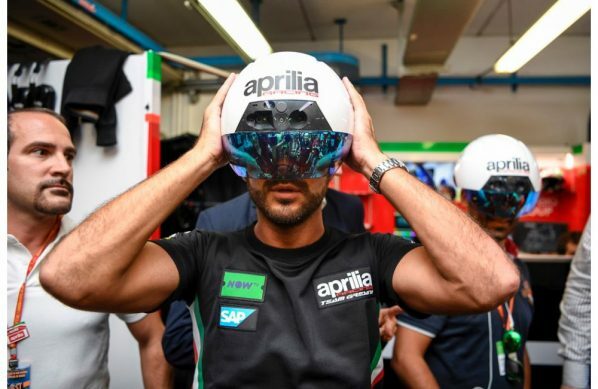 Aprilia Racing commissioned Realmore (a business unit of Equent Media Group) to develop a software application to be utilized on an augmented reality wearable device, DAQRI Smart Helmet, in order to visualize AR content that helps the mechanics during the preparation and maintenance of racing bikes. 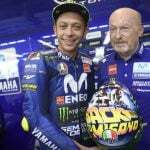 The technology will be put into practice during the San Marino MotoGP at the Misano World Circuit in Italy on September 8 -10, 2017. Characterized by a common passion for innovation and technological research, the partnership between Aprilia Racing and Realmore was born within the Open Innovation project of BacktoWork24 (first system in Italy for private investment in small businesses) and Aprilia Racing, to promote the development and visibility of innovative start-ups and SMEs. 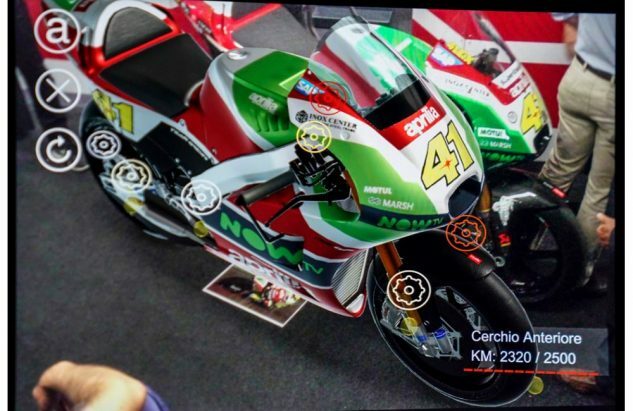 With AR, Aprilia mechanics are able to visualize content related to motorbike and infographics that respond to the user’s control in real time. The mechanics can interact with models of pinout connectors and see the wiring capabilities by looking at each connector individually. This feature involves speeding up the cable connection activity and virtually zeroing the risk of error by the mechanics. Through a 3D hologram of the entire racing bike, the mechanics will then be able to see in real time the telemetric data of the temperature of water, oil and tires at the point where they will be most useful. They will also be able to make a checklist of the wear on some parts of the bike and evaluate when to do the replacement. Remote Expert allows the chief engineer to communicate remotely with the mechanics by displaying overlay on the helmet screen strategic information such as the type of tires to be mounted, the kilograms of petrol to be in the tank or the lap number of the exit. 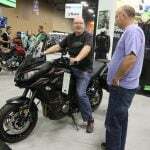 Using DAQRI’s Thermal Camera, you can scan the motorbike and receive information about the temperature of the oil and the water in the radiator and check for any anomalies. The collaboration between Realmore and Aprilia Racing has found a common place in an environment such as the MotoGP naturally faced with the latest innovations, excellence and technological development. 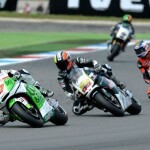 The choice to take advantage of AR technology, still little used in this environment and little known as smart assistance application, has quickly become a winning and wide-sighted one, a choice proven by the enthusiastic welcome of the Aprilia Racing Team.